2 Becoming a "full time" EHS. 3 Gathering knowledge and undergoing medical tests. 4 Taking control of my condition. Hello, My name is Amir Borenstein and, among other things, I created and manage this site (I also build other sites in the field of EMF). I am an Electronic-Computer controlled systems' Practical Engineer, with 16 years of experience in the Israeli Hi-Tech Industry as a Software QA engineer and team leader. Since I was hurt by EMF radiation and become Electromagnetic Hyper Sensitive(EHS) person, I spent many hours learning the field of EMF radiation and become an expert on dealing with EHS, EMF radiation health effect, EMF measurements, EMF reduction, and protection. I am an activist in the field or EMF and EHS awareness since 2006, including taking part in parliamentary committee meetings, attending scientific and technical conferences, and leading public activities in this field. I am in contact with regulative, engineering and scientific bodies both national and worldwide. My involvement in this field started when I become EHS. In the following paragraph, I will tell my story. The first time I felt that something is wrong with me was when I was 23, at around 1997. It happened when I asked one of my friends to use his mobile phone in order to make a short call. After 2 minutes of conversation, I began to feel pain in the upper right side of my head. After that phone call, which ended very quickly, I decided not to buy a mobile phone for the time being, and I managed to pass several years without paying more attention to this issue. A few years later, when I bought my first mobile phone I felt it again. In those days I did not know that this is a widely spread phenomena (about 10% of the people are EHS and only 2-3 % know about it! ), and that other people feel the pain the same way as I do. I assumed that there is something wrong with me, but I managed to avoid the problem and reduce the pain by making only short calls and always using a wired headset. At that time I did not use or own a home wireless phone so I assumed the problem I have is limited to Mobile phones and mobile phones only. Becoming a "full time" EHS. In my new apartment the living room and the bedroom shared a wall, on one side of the wall I placed my bed, and without knowing the consequences, on the other side of the wall, I placed a CRT-TV and the large fish aquarium filter. At work, the lab I was responsible for moving to a new room. 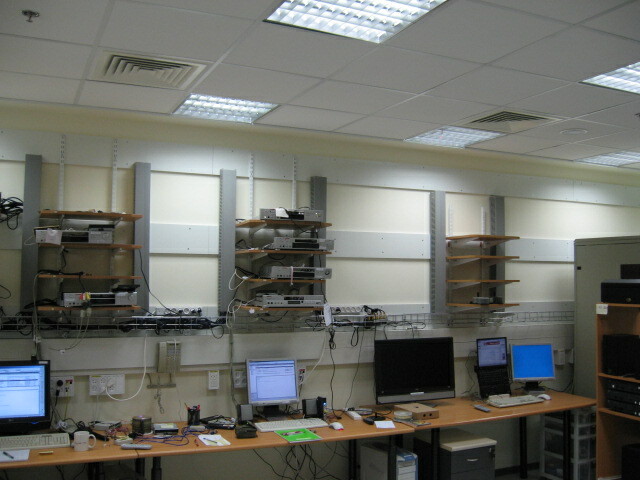 The lab's main electricity cabinet was located very close to the working station. Later on, I found out that this electricity cabinet emitted large levels of low-frequency magnetic radiation. At work, one of my teammates used to have long conversations on her mobile phone, sometimes for more than 30 minutes, most of the time sitting just next to me. Introduction of third-generation mobile phones in Israel was on its way, that meant more data being transmitted and more masts ( 2000 masts in 2003 nationwide to about 30000 masts in 2007). My "dark age" started with more and more frequent headaches, which eventually were combined into one long, non-stop, headache which lasted for more than 18 months!!! After several months I understood that this headache is not going to go away by its own and that I have to start doing something about it in order for me to get better. I started to read all kinds of web pages on the internet and was shocked by what I saw. Gathering knowledge and undergoing medical tests. The symptoms I had were the same as the symptoms that I had read about on the web pages. I was amazed that there is so much information on the web about headaches and that so many people suffer from headaches in their daily lives (males - ~10%, females - ~25%). Some of the web pages introduced all kinds of drugs or devices to ease the pain. Some talked about the possible cause of the pain. Some of the web pages that dealt with the causes named EMF (RF radiation) as a possible cause. This new information was aligned with my past experience with mobile phone radiation. I knew from my experience, that mobile phones cause me headaches after short use. 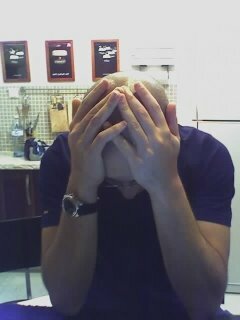 I thought that maybe mobile phones and RF radiation, in general, are the reason for my long headaches as well. Some of the web pages talked about a new disease which is called "Electromagnetic Hypersensitivity Syndrome" or EHS for short. In parallel to reading "all there is to read about headaches" I started a series of medical tests. I went to see my private doctor who sent me to a neurologist. This neurologist did some physical tests and sent me to have EEG and CT scan tests. The outcome of these tests showed that I am 100% healthy and that there was nothing wrong with me, at least nothing which could be viewed clinically on a CT or EEG scan. The neurologist was quick to write me a prescription for anti-stress drugs that I was requested to take daily, that was the last I saw of him. Taking control of my condition. After my medical tests and their outcomes, I understood that I have to take responsibility of my own life, I understood that the pain I am experiencing is not caused by something that will appear in an X-ray scan. I started trying out everything that might help. I turned my mobile phone off for good (using it only for extreme emergencies). I tried to keep some distance from other mobile phone users while they were having conversations with it. I went to see the kinesiology master, who sold me lots of vitamins and nutrition additives (I took them all, my memory and brain power was improved but the pain was still there). I bought some of the Qlink devices (I still use it today, some small improvement). I bought and read a book about cellular radiation and EMF, and then contacted the author (I am still communicating with her, she helped greatly). I bought a High-frequency EMF meter (that was one of the most important steps). I started to measure all my surrounding areas at home and at work and to avoid mobile phone and RF radiation exposure as much as possible. I bought a Low-frequency radiation meter. I did not expect this meter to have such a big influence over my life. It showed me all the low-frequency radiation sources in my house and workplace. I moved, removed, and handled all the low-frequency radiation sources in my house (which really helped). 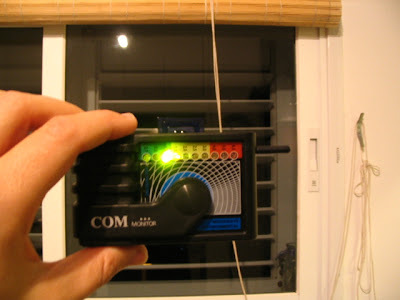 I installed high-frequency filters on the windows of my house (which really helped). I started seeing an IPEC (Integrated Physical Emotional Clearing)coach who helped me deal with the mental side and aspects of the sickness. I made my self a spacial radiation protection hat with a cloth that blocks electromagnetic radiation. Today I think steps # 5, 6, 7, 8, 9,10 and 12 were the most effective steps. Today, after taking those measures I can report that when I am not working I have only one or two headaches a week, when I am working I have several each day but most of them are moderate and don't last for long, nothing like the headaches and symptoms I used to have in the past before taking those "caution" measures. Once in a while I get exposed and suffer from a headache right away, and once every several days I come back home exhausted from a long day of exposure to low levels of electromagnetic radiation. In the year of 2008, I ended 11 years (!!!) of working the Haifa base high-tech company I was working for, moved to Tel Aviv and started searching for a new job. In every job interview, I explained my EHS condition. I felt that I am obliged to (even that according to the Israeli law I am not) and that it is for my best interest. I did not want to work for a boss or for a place that thinks my EHS is a problematic issue and did not want to work in a place with RF or ELF levels higher than I could endure at the time. I came to each interview with the EMF meters, explained about EMF and EHS and if the interview went well, asked to see the room and labs I was to work in and even do some preliminary testing. I got several jobs offers and chose to accept one that best fit my needs, both as a High-Tech professional and as an EHS person. I found several ELF magnetic and one RF radiation problems and was able to help to solve them. Coworkers that were EHS or that wanted to know more about EMF and how to reduce exposure came to me and asked for guidance, info, and help. Because of that and my public work as an activist, I was even nicked name "radiation hero" by some of my most close work friends. It was not all milk and honey, there were some bad days, bad weeks and bad months when I felt very bad. Please see the next few paragraphs. In the last year (2010) the company that I work for moved to temporary offices. The offices were very crowded and the levels of RF EMF/EMR(Electromagnetic Fields/Electromagnetic Radiation) were very high, due to the use of cell phones, smartphones, and the bad deployment of WIFI routers. According to the first allocation of working stations I was positioned to sit under a WiFi router. I asked to move away and I was given a table next to the manager's office. In this office, there were 3 young ladies who did not stop talking on their blackberry phones. In addition, I found it very hard to sit in the meeting rooms, in which there were usually lots of RF radiation, both from the wireless laptops and Smartphone users. My health deteriorated and all my medical records went down (as evident in medical tests). Every day, I came home exhausted and needed a few hours of rest or sleep to get it all back together, only to come back to the same horrible environment the next morning. Today I can say that if I had to go through it again I would probably quit my job. In the new offices of the company which I work for, I am sharing a room on the gallery floor, with 6 cell phone users. Most of them are using 3G cell phones, 2 are using GSM phones (2G phones, which I am more sensitive to), one of which is a blackberry (these are the worst). The wood floor is covered with metal plates to prevent the fire from spreading, and it also blocks all the RF EMF/EMR coming from the kitchen below us. When one of the guys receive a cell phone call I try to escape ASAP. I have RF meters on my table, and that gives me a head start by showing me the RF radiation emitted from the phones before the call is received. I still have problems attending meetings since most people use their smartphones during the meetings to pass the time. Most of the time the RF and ELF levels around me are low. Most days I feel OK, I have several headaches every day, but usually nothing too bad. Every once in a while (about 6 months) we all switch teams or/and working space. This takes adjustments and makes me deal with RF and ELF sources in the new sitting location all over again. Usually, in the first few weeks, I suffer for more headaches and symptoms until I manage to deal with all the new sources. In the company that I worked for, it was custom that every couple of months you need to change working teams, so everybody will work with everyone. This was way in the early part of 2012, I found my self with a new team of 6 people in some room. 4 of them used 3G internet-connected smartphones which emit RF radiation most of the day. Every time this happened I tried to come to an agreement with as many as possible of my team coworkers that they will not turn on the 3G data (internet connection) and that they will prefer to use the wired internet and phone in the office. This allows me to fell slightly less affected (bad). I had 2 RF meters on my desk, reporting the RF levels all the time. When someone got a call I usually would walk out of the office for a couple of minutes. There were good days and there were bad days. Most of the time I could feel my headaches, but in a way that allowed me to carry out my tasks. however, at the end of the working day, I was exhausted and was usually in pain. The drive home was hard on me, and it took some resting to recover. Together with Dafna Tachover, which is also an EHS person, I took part in a TV report about EHS and EMF health effect, first time on Israeli TV. The report put EHS on the prime time of Israel TV. Many people watched it and many people still remind me of it even today, 3.5 years away. Many people who show the report understood that they are also EHS, after seeing the report. After 15 years in the field of software quality engineering and testing, with more than four years in my last position, I had to leave my job and decided to abandon my High-Tech carrier altogether. In recent years I suffered on daily basis from the RF and ELF radiation at the high-tech working environment. And yet the need to earn a living overcame the constant pain and physiological struggle. In the last few months, the suffering and pain increased and there were more and more days full of pain when I felt really bad. My general medical condition deteriorated because of the RF and ELF reach work environment. Now that I had to leave my job, finding a new job in High Tech environment which is full of cell phones and wireless equipment looks impossible. I now open a new page and hope to spend more of my time in activities that are related to activism and awareness to radiation health risk and EHS. It seems that my EHS condition has taken a high price from me, not only in my health but also made me stop working in the field that I studied, developed (I was one of the first in the country to be a QA engineer), was good at it and loved it. After I left my high-tech career behind, I am investing 100% of my time in EHS and EMF related work. In addition to my public activities, I also run, since 2012 a web store which offers EMF meters, EMF home protection, EMF blocking fabrics and RF Blocking cloths. It is called "For EHS By EHS" www.4EHSByEHS.com. The site is especially made for EHS people and for people who understand the sick or EMF exposure. Most of the days I am working from home and feel OK. I meet with costumers and EHS people in my home office, passing basic EMF training and teaching them how to use the EMF meters, and how to protect themselves. Every time I leave the neighborhood I have to wear RF Blocking cloths (Jacket or poncho). I also wear an RF protection hat all day long. Even going to the local post office (to send my products to costumers, have it's "headache price". I don't even consider using the public transportation, flying or using the elevator. Every time I go out to a public place I am very careful and most of the time cost me with pain. 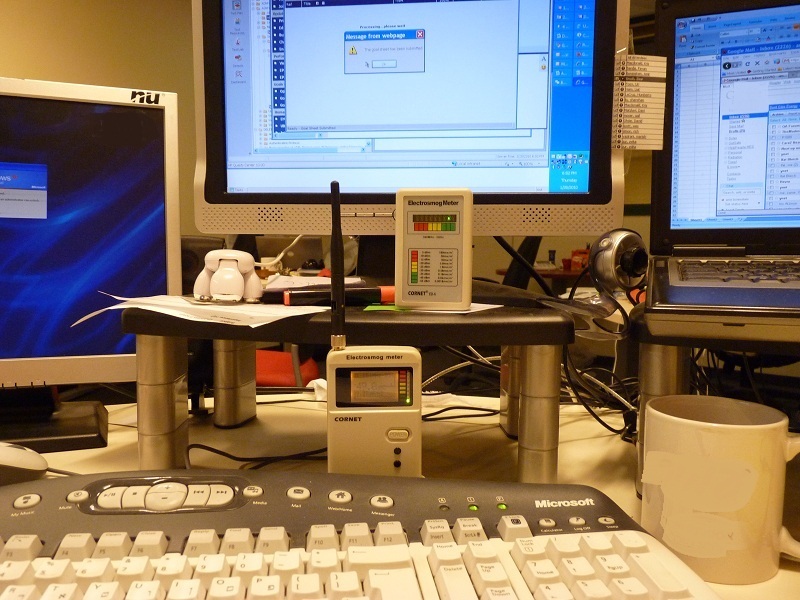 I don't think that I will ever be able to work again since I will not find a EMF clean workplace/work-space. Although I currently manage to cope with my condition, and even work, the future is not clear for me and other EHS. This TV article was done by Shirly Berkovitch. In the article 2 EHS people , Myself and Meni Benari, present our story, there is a review about EMF and EHS. In addition, it covers the high so called "safety standards" and the deployment of WIFI in schools. This report was aired in Israel CH1, main report/investigation program. Together with many EMF awareness activists in Israel and from around the world, I took part in a TV report about EHS , EMF health effect and WIFI in schools. The TV documentary, which started as a 10 minutes report on EHS and grew to be a full episode on EHS. EMF and WIFI in schools, was views by lots of people, in prime time in the Israeli main leading TV channel. The TV, fish tank filter were on the other side of the same wall as my bed. No radiation after installing a high frequency filters on the main window in may living room.